Women are generally emotional creatures. So, whether you're just starting to get to know that special girl in your life or she has been your girlfriend for some time, it can be helpful to know what to say to make her swoon and knock her off her feet. This can help get you out of trouble if you've made a mistake, or it may just put a smile on her face. Saying, "I love you," can make her smile. Tell your girl that she is beautiful. In general, women are under a lot of pressure to look good and on par with societal standards. As a result, nothing can be sweeter than reminding your girl of how much you're attracted to her. Before she can ask you how she looks in her new dress, tell her that she is stunning and you are lucky to have her on your arm. In addition, don't be afraid to point out things about her that you think are beautiful. For example, "you have beautiful eyes," or "I love your smile." Saying, "I love you," can be a big step, but when your feelings are strong and you're ready to take the leap this is one of the sweetest things you can say to your girl. If you've been in a relationship with your sweetie for a long time, and you've already told her you love her for the first time, don't be afraid to look into her eyes and say it again. 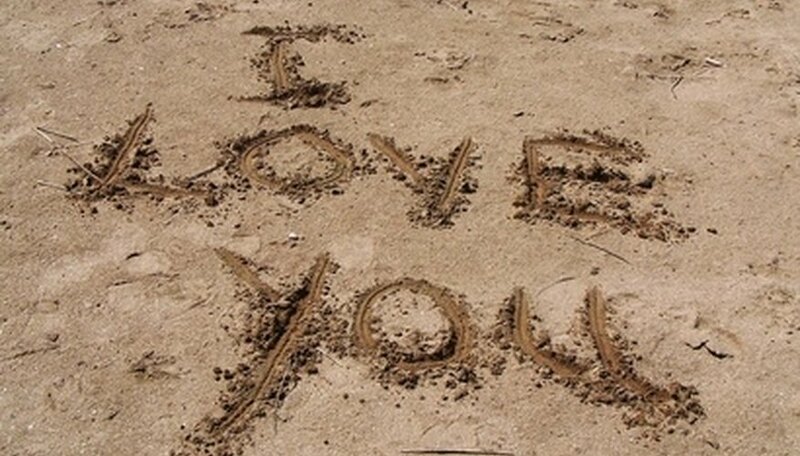 The words "I love you" can offer your girl reassurance and confidence in the relationship. It's a special way to show her how deep your feelings are. Tell her you miss her. This is particularly appropriate for long distance relationships or couples who don't get to see each other as often because of work. However, those three words can also apply to couples who spend a lot of time together. When you're at work or school, call her or text her and let her know that you're thinking about her and you can't wait to see her again. Saying "I miss you" can really resonate with a girl, regardless of the distance. Leave your ego at the door and find creative ways to whisper proverbial sweet nothings in her ear. If you're out of ideas, websites like futurescopes.com have suggestions of sweet sayings for your special someone. For example, "I'd rather not be with anyone than you," "I trust you with all my heart"and" I enjoy every moment with you." Whether you choose to grab a saying from a website list or come up with your own, it's important that you speak the truth and tell her how you really feel about her in your own way. Laren, Brandi. "Sweet Things to Say to Your Girl." Dating Tips - Match.com, https://datingtips.match.com/sweet-things-say-girl-6082355.html. Accessed 21 April 2019.